nutella and kahlua hot chocolate. A cosy Christmas drink featuring some of my favourite flavours; Nutella and coffee. Combining the perfect aromas of Kahlua coffee liqueur with indulgent chocolate and whipped cream, this is a real festive crowdpleaser. Top it off with a swirl of cream, edible glitter and a candy cane for and extra Christmassy touch. Divine! homemade peppermint candy cane gin. I do love a flavoured gin. So when I had some leftover candy canes from Christmas, I thought I'd experiment with some homemade gin myself. This festive favourite is super easy to make, just choose your favourite plain gin, add candy canes and allow it to infuse. This homemade peppermint candy cane gin recipe really is that simple. pigs in blankets mac 'n' cheese. Now we’ve opened the first door of our advert calendar, dropped a few hints about pressies and booked that wreath making class. Is it finally December? The season for all things jolly, decking the halls and jingling bells. With that comes some of the best food back in the supermarkets too. Sprouts? Love them. Chocolate log? Can’t get enough. Pigs in blankets? An absolute must. I love a good brunch, especially on a lazy Winter weekend. So what better time than Christmas to plan an indulgent breakfast with a piping hot coffee and fresh orange juice. This homemade parmesan rosti recipe is made with Parmigiano Reggiano; a hard Italian cheese with a slightly salty, fruity and nutty aroma. It's perfect for adding a hint of something extra to a crisp potato rosti, which is perfectly complemented by an inviting poached egg with bright, runny yolk. Parmigiano Reggiano is a PDO product, exclusively produced in Parma, Modena and Reggio Emilia, on the plains, hills and mountains enclosed between the rivers Po and Reno. With nine centuries of excellence, the Parmigiano Reggiano is aged for its beautiful taste and distinctive crystals. It's delicious just sliced off and sampled on its own, but it really works for this recipe too. how to create the ultimate cheeseboard: video. A strong cheddar, a creamy blue, a crumbly white; everyone has their favourite cheese. Cheeseboards can be pretty personal too. I love a smoked cheese or a rich Brie, as well as dunking warm bread into freshly baked Camembert. It's true Christmas isn't complete without a cheeseboard. And since you might have guests coming over to share it (whilst we all wouldn't mind a cheeseboard to ourselves), I've created what I think is the best cheeseboard spread to give you a few ideas. Perfect for lunch, a festive spread or as part of a savoury afternoon tea, a warm plate of fresh cheese scones are always a welcome addition. This scone recipe in particular premium twist with a hint of festive cheer in the form of luxury Parmigiano Reggiano cheese, Parmigiano Reggiano infused butter and sweet and tangy cranberry sauce. One of the world’s oldest and richest cheeses, its no surprise this PDO cheese is often referred to as the King of Cheeses. A hard Italian cheese, Parmigiano Reggiano, sometimes referred to in the UK as parmesan cheese, is still produced today as it was nine centuries ago. With a very special make-up and recipe, the product is only be allowed to be made in particular areas of Italy, with specially selected dairies and producers of the highest quality. This makes it a real treat all year round, but especially in the festive season when it's time to indulge in some delicious cheese. mince pie christmas freak shake. It's beginning to look like... I want to eat all the Christmas food. This creamy, cinnamon spiced, chocolately Christmas freak shake is the most inviting treat to enjoy whilst watching those festive films. Whizzed up mince pie is met with a good quality ice cream, milk, cinnamon and cocoa powder before being stacked with mini mince pies and striped candy canes. Indulgent! Do you think you could devour this mince pie freak shake? Go on... I challenge you. It's Christmas, after all. walnut and white chocolate spiced cookies. These colder days are giving me the urge to bake. And the cosy evenings with blankets and candles are making me want to eat sweet treats with a cuppa or hot chocolate. So the temptation to whip up a fresh batch of cookies, when they only need cupboard essentials and less than 30 minutes is strong. This spiced cookie recipe has a delicious and warming base, with sweet half melted white chocolate against crunchy walnuts. Dreamy! An autumnal inspired brownie recipe that’s perfect to enjoy curled up with a cup of tea. These indulgent chocolate brownies combine the rich flavours of dark chocolate, sweetness of milk chocolate pieces and nutty hints of chestnut. I’ve used the Co-op Irresistible 70% Dark Chocolate for this recipe, which has both floral and spicy notes. Plus they’re individually wrapped in beautiful gold paper, so you can enjoy them as an occasional, but decadent, treat. The Irresistible Milk Chocolate lived up to its name too. Made with carefully selected Peruvian cocoa, it has a smooth and creamy taste which makes it perfect to scatter into a brownie mix as a sweet contrast against the intense dark chocolate. aubergine, paneer & sweet red pepper curry. A super easy curry to make-ahead as a midweek meal, or simmer away on a weekend. This medium spiced vegetarian curry doesn't really have an origin as such. I was influenced by Indian and Thai flavours but on the whole it's pretty made up - why not eh! With a tomato base, the paneer and deliciously softened vegetables are flavoured with the likes of lime, red chillies, ginger, garam masala and fresh coriander. The dish is finished off with a crunch of peanuts and extra lime juice. I ate it with chopsticks just because it made the paneer fun to skewer, but there really are no rules here. If you're a fan of tikka masala and red Thai curries, you might just like this too. reece's peanut butter cup macarons. 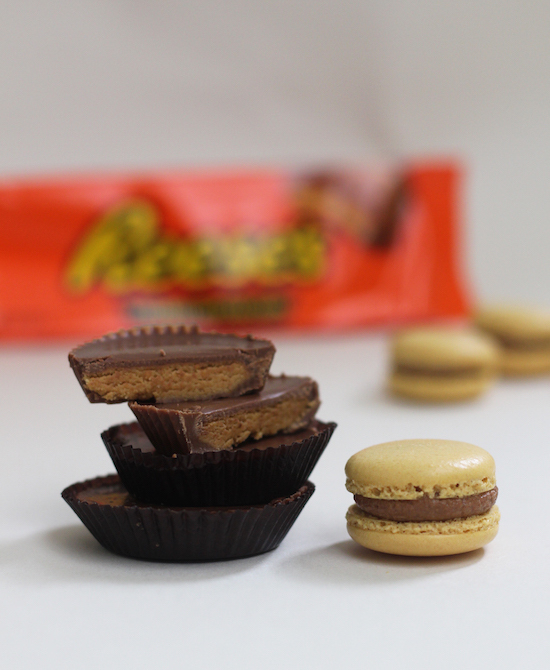 Some tasty little macarons made to taste just like your favourite peanut butter treat. Creating a Reece's Peanut Butter Cup style buttercream, which tastes like chocolate peanut butter, I've made some mini Reece's inspired macarons. Good luck trying not to eat the frosting right out the bowl... believe me it will be worth it. A comforting Italian inspired bolognese recipe, ideal to batch cook for an easy midweek meal. Combining pork and beef mince, this hearty recipe goes towards your five a day with sweet, softened red peppers and slightly salty black olives. Serve up with your favourite pasta and a good grating of Parmigiano Reggiano cheese. Though for me it has to be spaghetti. Classic. An easy cinnamon bun recipe which is perfect for the pumpkin season. One of my favourite things about Autumn is the excuse for all things hygge. Pronounced hoo-gah, hygge is the concept of cosiness, hailing from Denmark and Norway. Friends, family, fun and loved ones around doing things that you love. Although it's an all year round thing, it perfectly ties in with the Autumn and Winter want to curl up with a blanket with a cuppa and candles. I'm actually off to Copenhagen for my 30th next week. But for now, I thought I'd satisfy my appetite for all things hygge and Scandi with this Autumn inspired pumpkin cinnamon bun recipe. An Autumnal dessert inspired by one my favourite desserts; the Bakewell tart. This recipe takes on almondy frangipane sponge encased in a sweet, buttery pastry. The tart is then topped with sliced apples, drizzled with icing and scattered with extra almonds for good measure. slow cooker pumpkin sponge cake with pumpkin cream. An inviting Autumnal dessert for the darker days; this slow cooked pumpkin sponge really brings the best of the season together. Autumn is my favourite, so when I was invited to get creative for the Crock-Pot Crocktober Halloween Challenge, I couldn't wait to conjure up a cosy recipe. Made in the versatile and convenient Crock-Pot, the slow cooking of this pumpkin sponge really infuses the cinnamon, nutmeg and ginger spices into this dessert. leaving a moist and buttery texture. This appliance really is deserving of its place on the kitchen counter. From dinner to dessert, the Crock-Pot Express Multi-Cooker can get to work steaming, roasting and sautéing whilst you get on with other everyday tasks. Although slow cooking lends itself to the colder months, you really get make anything all year round. Scroll down to see how this creation really is pretty much as easy as simply pressing a button. A comforting recipe that encompasses three of my favourite things; Autumn, pasta and cheese. This super simple seasonal dish only requires a few ingredients, and can be made with butternut squash once the pumpkin season is over. Perfect to make or bake ahead and eat over a few days, simply warming up for a welcoming midweek meal. Heavenly, autumnal and just a tiny bit indulgent as it actually features low fat Quark. Plus, whats wrong with a little extra cheese when you're getting your five a day, right? Balance. pressure cooker tandoori lamb with coconut and turmeric rice. From paellas to puddings and risotto to ribs, who knew there was so much you make in a pressure cooker? Long gone are the days of noisy pressure cookers squealing on your Granny's stove; they've come a long way since then. Safe and smart, the Prestige Smart Plus Pressure Cooker include a visual pressure indicator that raises to indicate when the cooker is at pressure, as well as a directional pressure regulator to ensure safe release of steam away from you. They're a real time saver too, usually knocking off a third of your usual cooking time. The results are impressive too, keeping meat and seafood delicate and tender, rice fluffy and vegetables flavoursome. The lid seals in nutrients too, which is always a bonus. Inspired by the Prestige and Stacey Solomon collaboration, I've come up with my own creation. A spicy tandoori lamb recipe with coconut and turmeric rice, all made in the slow cooker. All in less than15 minutes. #NoPressure.